Jake made this recommendation for us to visit Murrieta’s Mexican Restaurant over the weekend. 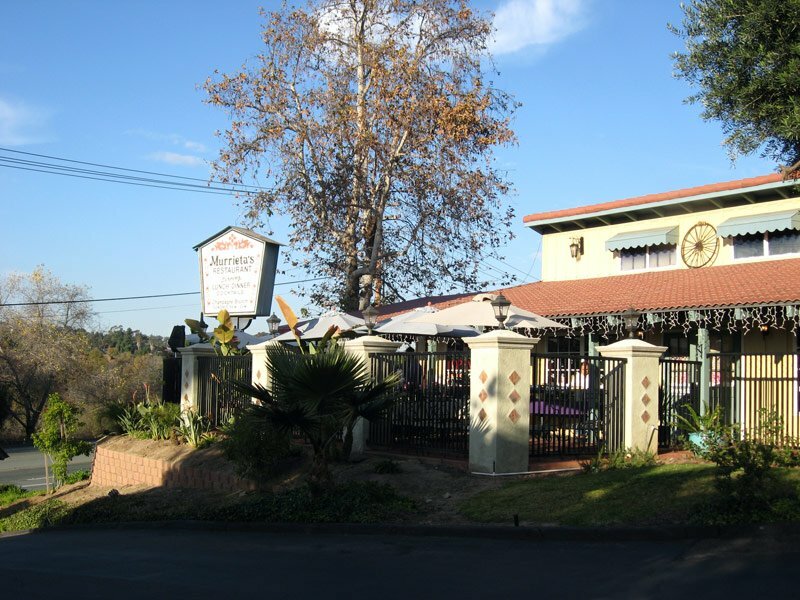 We were down in the area and after an errand we headed over to the restaurant for a nice, quiet lunch. I thought this was Jake’s first time at the restaurant, but halfway though lunch he told me he had been to the restaurant quite a few times in the past but wanted to go there with me. It was some fancy-looking digs for lunch. The waiters all wore uniforms with ties and vests and bustled about the restaurant (they had a big party going on on their outside patio). The nice thing about most sit-down Mexican restaurants are the free chips and salsa. The chips were freshly made and pipping hot. No salt on them but that’s easily remedied with the salt shaker. They also served hot carrots and 2 kinds of salsa. I preferred the red salsa. It was smooth and not chunky at all (which I like) with the right amount of heat and spices. I’m not a spicy kind of girl and this suited me just fine (and suited Jake, who loves spicy stuff). My mouth did feel like it was on fire a bit after awhile though, but it was a good kind of heat. I’m bashful to say that between the three of us (myself, Jake and Jake’s son) we had about 3 baskets of chips. But it was mostly Jake that ate them. I went back and forth between a few things – I was looking at the Chile Colorado and the Carnitas before I settled on getting the Enchiladas ala Crema ($11.95). 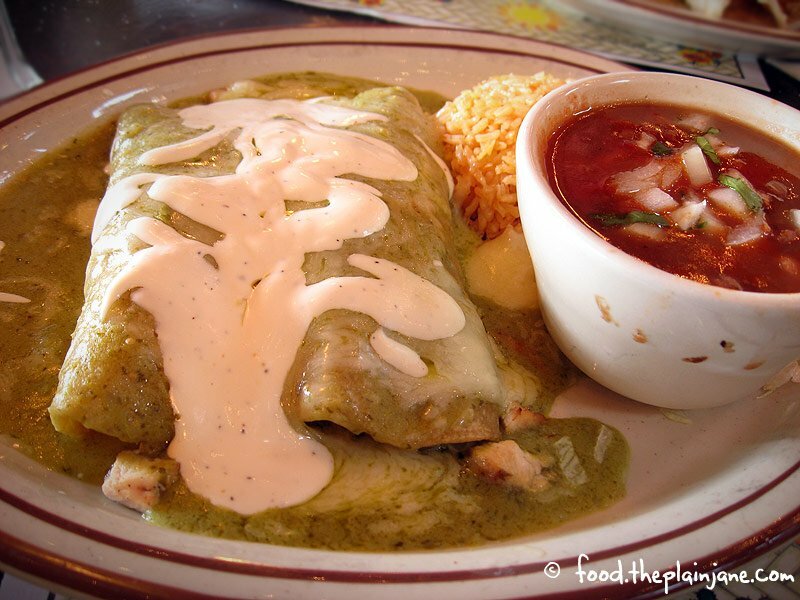 These enchiladas are filled with grilled chicken breast and then smothered in this green sauce and then topped off with a sour cream sauce and cheese. The enchiladas were very flavorful – the chicken was tender and had a good grilled flavor to it. I really enjoyed the sauce as well – it was creamy and tasted light to me – not heavy or bogged down at all. Really excellent. My sides were Mexican Rice and Pinto Beans. I’m not a big fan of beans in general so I didn’t really eat the beans. I had a few bites though and I liked eating it with the fresh onions on top. When I ran out of onions, I stopped eating the beans. The rice is pretty standard if you ask me – good but not really spectacular to me. I was just glad there were no chunks of tomatoes in it. 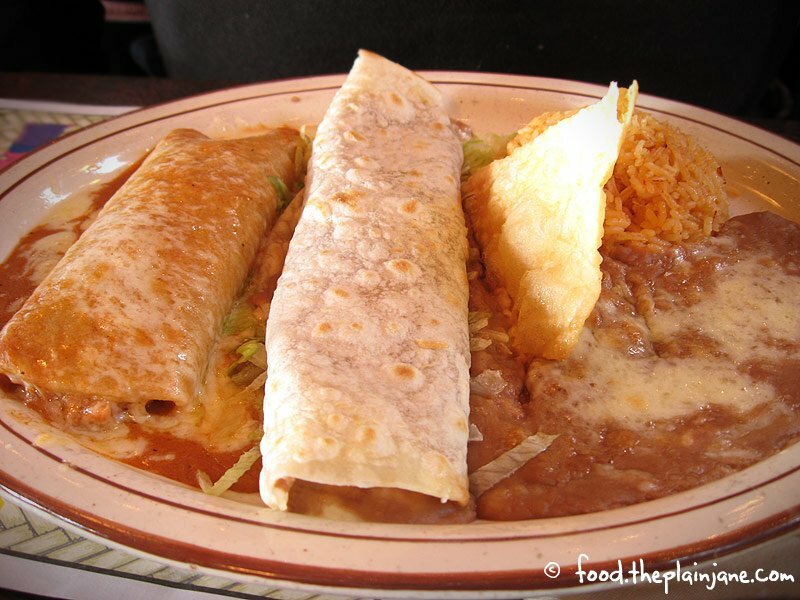 Jake got an Enchilada and Bean & Cheese Burrito combination plate ($10.95). Jake’s son got a single enchilada combo (not pictured) for $8.95. Jake got a regular chicken enchilada (I don’t think I want to go back after that sour cream sauce I had!) and he really enjoyed it and his bean & cheese burrito. He gave me a bite, but again… not much of a bean person. Jake loved the beans though and as someone who does really like beans, I think that’s a testament to their goodness. They serve deep fried ice cream – if I had had any room left in my belly ( if I hadn’t eaten so many chips) I could have experienced this treat, but alas, it wasn’t meant to be. Perhaps for a future visit? They also have another location in Tierrasanta called Tierrasanta Mexican Food with the same menu. 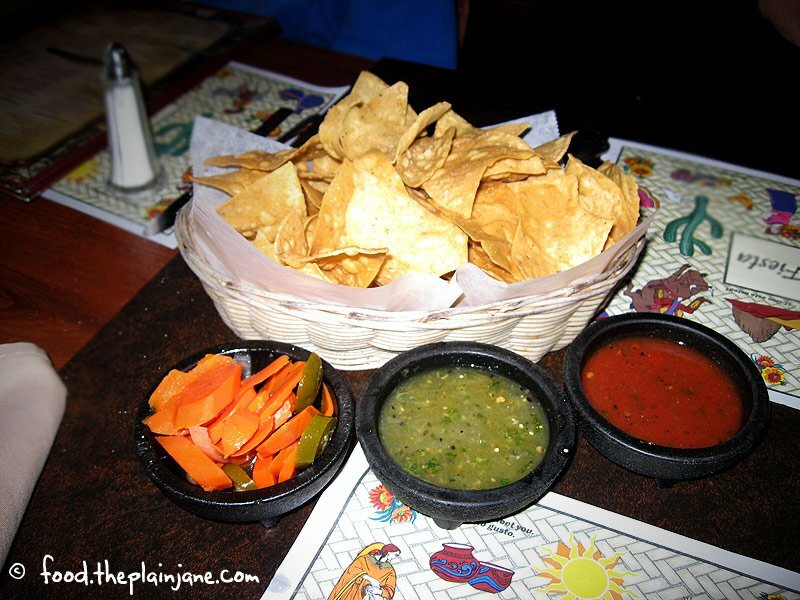 hi mary – the chips and salsa are pretty decent at murrieta’s. haven’t been there in awhile. used to go there with the co-workers for happy hour.